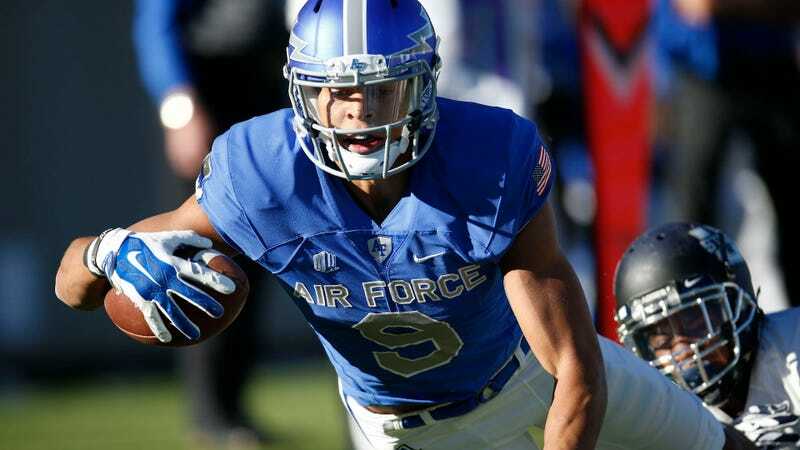 Air Force’s all-time leading receiver Jalen Robinette did not graduate as planned from the Academy during this morning’s ceremony. An Academy spokesman told Nicki Jhabvala of the Denver Post that Robinette was removed from the graduation lineup after the school became aware of information that put his “eligibility and qualification to graduate” in question. The situation is currently under review and specific details have not been released, though the spokesman confirmed that neither any criminal wrongdoing nor anything related to Robinette’s football career is responsible for the review. Robinette was expected to be selected in this year’s NFL Draft, but a new policy enacted last month ended the Academy’s position of allowing athletes to defer active duty in order to pursue professional sports. Instead, Robinette would be required to serve with the Air Force for two years before being allowed to attempt an NFL career. He was set to be commissioned at the U.S. Air Force Academy Preparatory School, where he would serve as a graduate assistant for the football team. Now, that’s uncertain. If Robinette is found ineligible to graduate, per Jhabvala’s reporting, he could be required to pay back his taxpayer-funded tuition or to serve as an enlisted member.